Silkscreen printing is a process that prints text and illustration on the top of CDs, DVDs, Blu-ray, and other recordable discs by employing centuries old techniques involving ink, stencils, and rollers. The basic concept is this: ink is pressed over a stencil with a roller, allowing the ink to spread across the desired surface through a fine mesh screen that rests below the stencil. This is typically handled by professional media duplication and replication services. The process used to print on recordable media like CDs and DVDs is nearly identical to the process developed hundreds of years ago for other mediums. 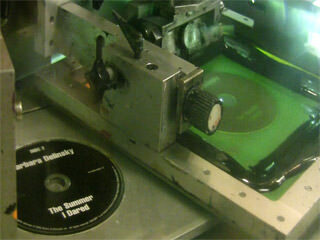 The disc rests in a tray of an automated, silkscreen machine. Up to 5 spot or Pantone Matching System colors of specially lacquered ink are precisely measured and dispensed. Using too much will cause drips and excessive spread which could ruin the artwork or text. Silkscreened discs also use a white undercoat, known as a flood coat. These are like disc primers that are layered on prior to application of the image or text. It provides a foundation which results in more accurate color usage. It also functions as a neutral base to prevent all or some sections of the silver disc reflection from showing through. Next, a roller—which functions much like a household paint roller—smooths the premeasured ink across the disc over a plastic design stencil and through open areas of the fine mesh screen. After each coat of ink, the disc rotates to account for ink drying while the new layer is applied to the roller. After rolling, discs may be treated under an automated UV lamp for a damage-proof finish. There is an alternative to using a stencil. Layers of photographic film in their individual colors can be generated based off a user’s artwork to block parts of the mesh screen to comprise the image produced by the application of ink with the roller. Print resolution ranges between 80 and 200 DPI (dots per inch) depending on the quality of screens used by the printer. Silkscreen printing has a few advantages. It is cost effective for high volume orders and provides the highest quality color matching for solid color surfaces, crisp vector text, and images. You can also maximize the use of the disc’s surface area as images can be printed to the very edge of the disc. One major disadvantage is the lower resolution is not well suited to raster graphics such as photographs. This limits the type of artwork hat can be used when compared with inkjet. Also, high set up costs for silkscreen printing does not justify its use for small duplication orders.